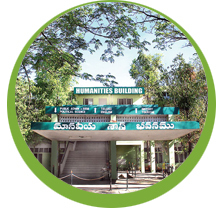 Started in 1967, the department of Telugu offers M.A., M.Phil. courses and Ph.D. research programme in Telugu Language and Literature. It has so far guided 98 scholars for Ph.D. and 100 scholars for M.Phil. It has published 19 issues of Research Journal “VIMARSHINI” and 12 books and seminar proceedings. The faculty have completed four major research projects and twelve minor research projects on important and interesting topics.In 2007, the UGC included the department under SAP (DRS) programme. Four faculty members got the Best Teacher Awards from the Government of Andhra Pradesh. Eight faculty members won 21 Literary Awards for their best writings.